I have been out the last couple of days undertaking fieldwork for a building stones project, but today I was treated to a glimpse of a gem of a little geological section being prepared. Those of us who work in geoconservation talk a lot about geodiversity but this must be the most geodiverse section I have come across. 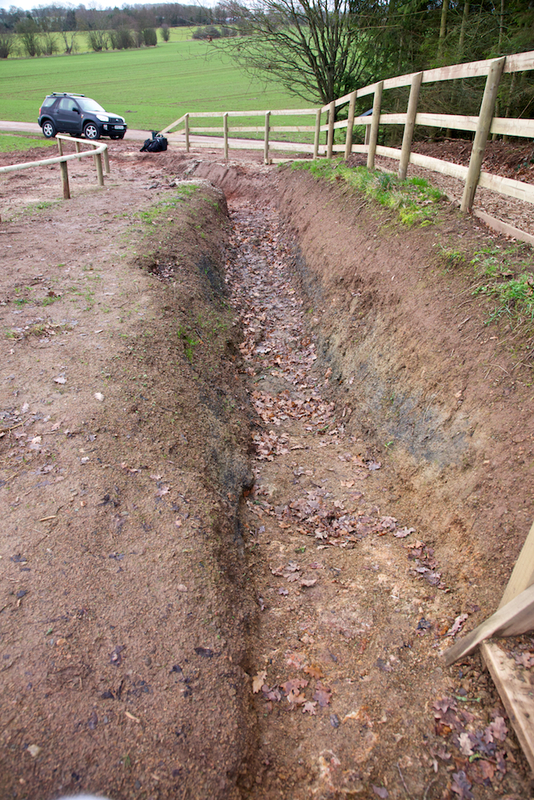 It is a trench, only about 100m long but displays rocks from the Precambrian, Cambrian, Silurian, Carboniferous and Triassic. The trench runs across the crest of the ‘Malvern Axis’, a major monoclinal fold trending north-south through central England that brings up Precambrian (~677 Ma; Cryogenian) to the surface. The Malvern line separates the two Precambrian terranes of the Midlands Microcraton, Wrekin Terrane to the west and Charnian Terrane to the east, that forms the solid basement of England. 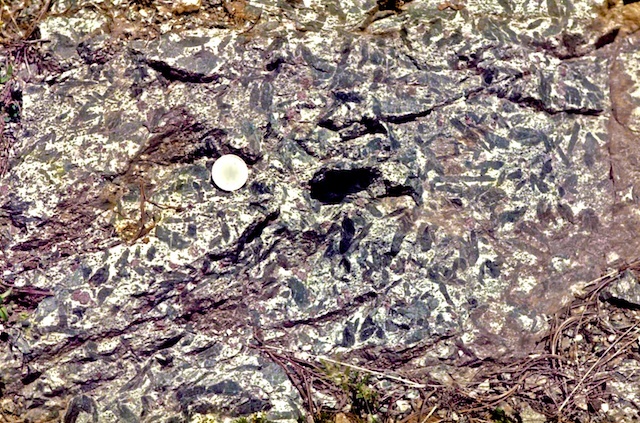 These Precambrian igneous rocks are unconformably overlain by Middle Cambrian Malvern Quartzite, and then Upper Silurian (Pridoli) Raglan Mudstone, and Upper Carboniferous (Moscovian) Halesowen Fm. This sequence was folded and thrust during the Variscan Orogeny at the end of the Carboniferous into the north-south Malvern Axis. Extension during the Triassic produced normal faulting along the Malvern Line and deposition of Middle Triassic (Anisian) Bromsgrove Sandstone to the east in the Worcester Graben. 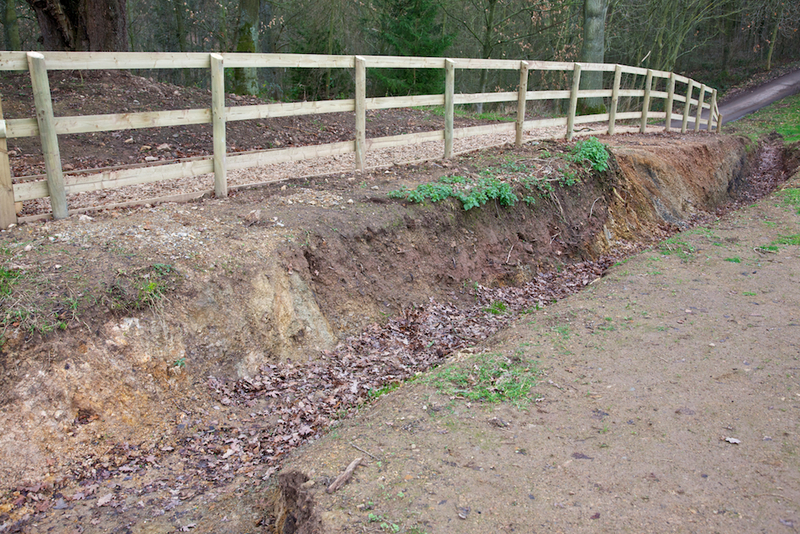 All this is being exposed in just one 100m trench, albeit somewhat tectonically shortened. Standing on the axis, this is the view to the east. In the trench, the light coloured material in the foreground is Precambrian Malvern Complex, succeeded by grey/green and grey Carboniferous, red Silurian muds and Triassic sands towards the car. To the west, the white is Cambrian followed by Carboniferous and Silurian on the other side of the axis. Note that many of the lithological identifications are still tentative. The section is still in the process of being created and is on private land, but should be stunning when finished. Ann, at Ann’s Musings on Geology is asking for one’s favourite geological picture (only in American) for this month’s Accretionary Wedge. I’m late for this one and most of my geology photo archive isn’t on this laptop, so I’m going to go with something that I have to hand. This image is one of my gigapans (in this case a matrix of 16 x 6 photographs stitched together). It shows the foreshore at West Angle Bay, Pembrokeshire, Wales. The view looks westwards towards Milford Haven and shows the Lower Carboniferous Limestone contorted by a series of Variscan thrust related folds. One of the thrust planes is seen in the left of the image, over-steepened by the folding. To the centre of the image are a pair of whaleback periclinal anticlines. The beds then steepen again to vertical on the right via a tight syncline. But the beauty of a gigapan image is that one can dive in and view the detail like the slickenside lineations on the thrust plane or the writing on the buoy. October’s Accretionary Wedge is being hosted by Matt Kuchta at Research at a Snail’s Pace on the topic of deskcrops. The deadline for the wedge is fortuitous as I can get it to coincide with my three hundredth deskcrop this year! Back at last New Year’s Eve I was sitting with a group of fellow travellers around a camp fire at a Bedouin encampment on the edge of the Sahara Desert in Morocco exchanging new year’s resolutions. I rashly suggested that I would take a photograph of a rock every day in 2010 and Project Rock365 was born. How long ago that seems. It has been a long slog since but I have now made it to day / rock 300. 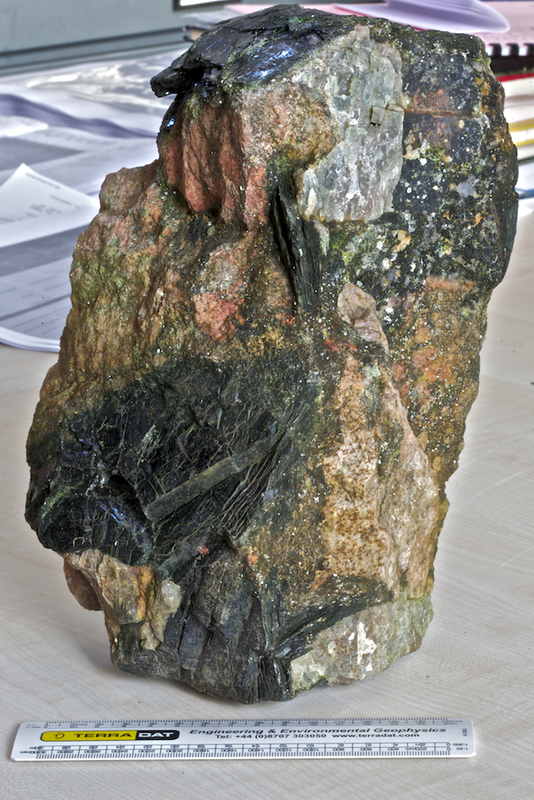 I have saved today’s rock for day 300 and the accretionary wedge as it is one of my favourite samples which has pride of place in my home collection. 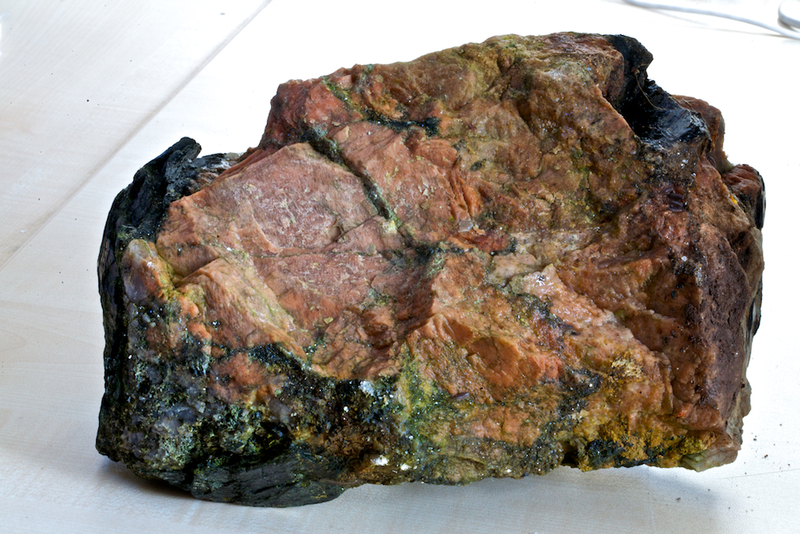 It is a pegmatite sample from the Narestø Feldspar Quarry, Flosta Island, Arendal, Aust-Agder, Norway. 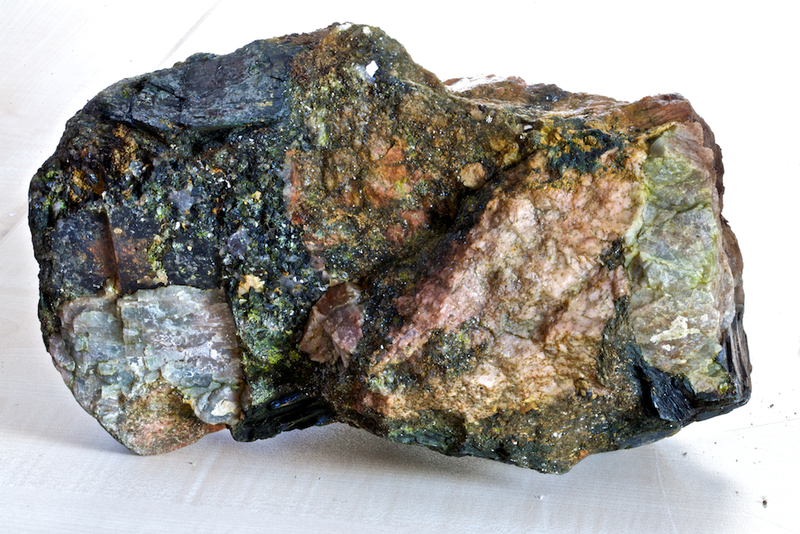 The rock contains some really large feldspar and biotite crystals. Unfortunately, I can’t remember but else about the rock and google is not providing me with much help. 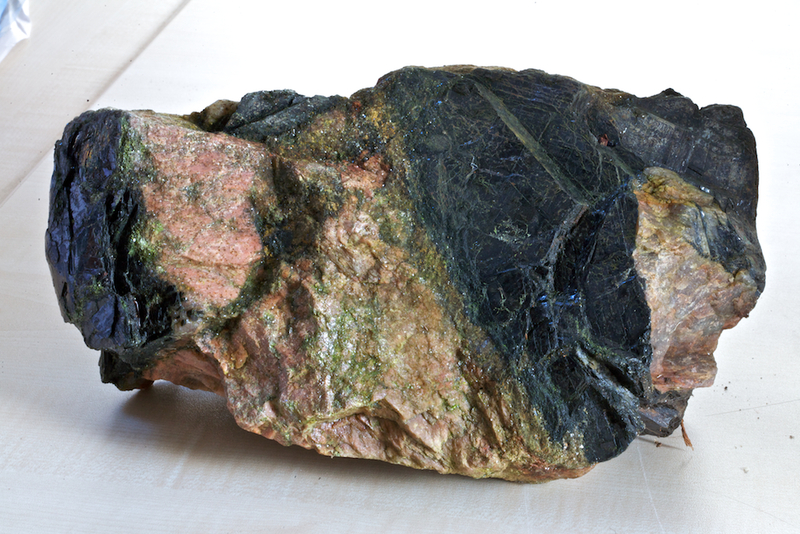 The pegmatite was collected on the Keele Geology foreign fieldcourse to Norway in 1991 (in fact my field guide tells me it was on Friday July 12). The Norway fieldcourse was a long tradition at Keele, now sadly superseded. To keep costs down, the geology department (as it was in those days) had its own tents, folding tables and chairs, cooking equipment and gas stoves. We took the ferry to Bergen and traversed Norway twice, out to Oslo and then back to Stavanger, staying at camp sites along the way. I actually did this fieldcourse twice, once in 1989 and again in 1991. 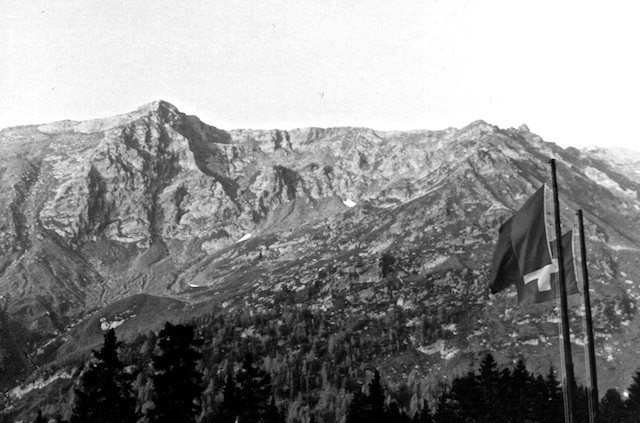 We even took enough tinned food to last a fortnight to keep the cost low as Norway can be expensive, but the same logic didn’t quite work the following year when we went across the Alps and actually took tinned Italian tomatoes back into Italy! The fieldcourse mainly covered high-grade metamorphic and igneous rocks so I was not that much use of the teaching side apart from the structural mapping at Slemmestad and some of the Caledonian nappe structures at Röldal, my role was much more that of van driver. I did however learn a huge amount from our former mineralogist, George Rowbotham. Matt asks if we could include a scary dimension to the post. I can’t really think of anything scary except I’ve a sneaking feeling that the sample might be a bit ‘hot’. All three hundred deskcrop images can be found on my companion posterous blog and at my flickr site. A google map with links to the geotagged images is embedded below. 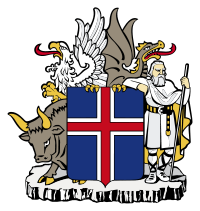 Since there is a current meme in the geoblogosphere on columnar jointing I’m going to have to join in and add an image from a country that actually has a piece of columnar jointing incorporated in its coat of arms – Iceland. In case you are wondering, it is the plate that the shield rests on. 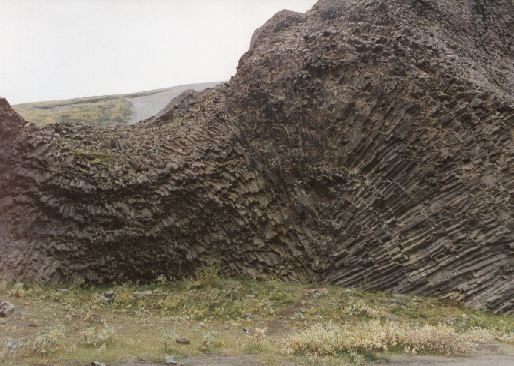 This columnar jointing is from the Jökulsárgljúfur National Park, part of the larger Vatnajökull National Park in the north of Iceland. It shows that columns do not have to be parallel, just perpendicular to the cooling surfaces, in this case lava tubes. Lockwood DeWitt at Outside the Interzone is hosting this month’s accretionary wedge where he asks “What is the most important geological experience you’ve had?”. The stress here is on the word important. Picking the most important is incredibly difficult for me. 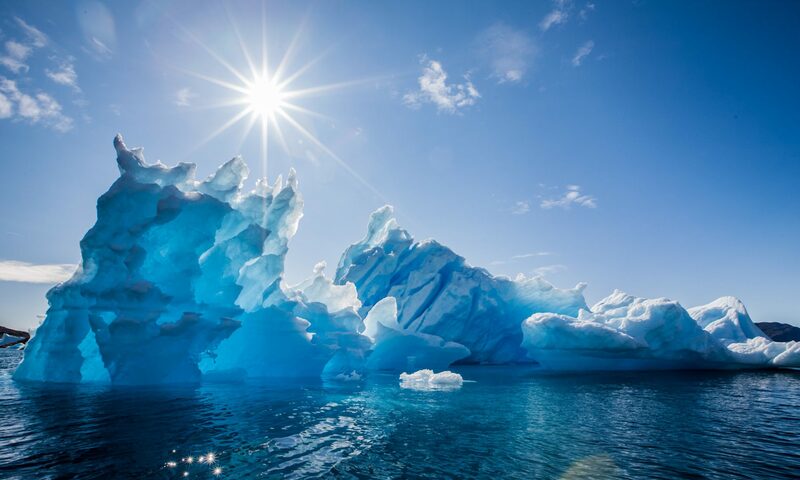 I have been fortunate in my earlier career to have all sorts of important geological experiences, from climbing the summit of Mt Fuji in Japan to exploring the deepest wastes of the Atacama desert, from standing at the top of Monte Perdido in the Pyrenees to the bottom of the Black Canyon of the Gunnison in Colorado. 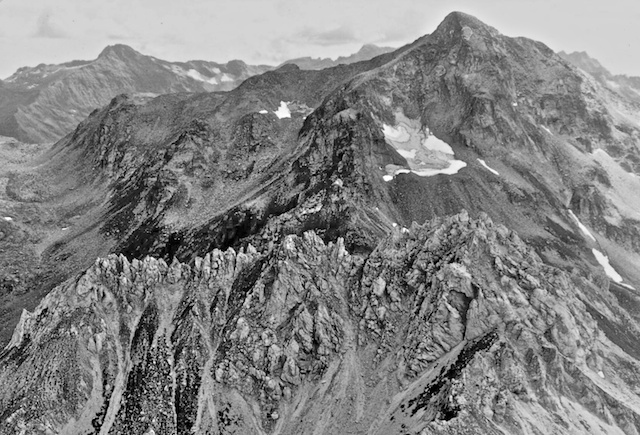 However, the most important for me has to be my undergraduate mapping in Lukmanierpass, Switzerland because it was important to me on so many different levels. I’ve already covered this way back in Accretionary Wedge 11, Field Camp, so I’ll try not to repeat myself too much. The first part of the importance is because it was a turning point in my life, the point where I grew up. Up to that point I had had something of a sheltered upbringing. I had not travelled abroad except for a “De la Beche Club” (the student geology society at the Royal School of Mines) cycling geology field weekend in Northern France, and I certainly hadn’t been abroad alone. There were three of us sharing a large frame tent in Switzerland, but the car could only take two plus the tent, so I had to make my way there by train. The Swiss railway system is incredible and runs to the second. It was the first time that I saw proper mountains. The metre gauge train from Göschenen at the northern end of the Gotthard Tunnel climbing up to Andermatt is an experience in itself. Travelling alone across Europe gave me the confidence to go to so many other places since then. It was also the first time that I had done proper independent mapping. Prior to this our mapping training was done as buddy pairs but here I was on my own. We wouldn’t be allowed by health and safety regulations to do this today, which is a real shame because it was a wonderful experience. It was just me against the rock. I had to sort things out for myself. It took me about four weeks to work out why in one part of the area the bedding/cleavage relationship was telling me that the beds were upside-down where as I knew from the stratigraphy that they were the right-way up. It was a struggle, but I cracked it – myself. The geology was incredible. I’ve never really seen anything like it before of since. 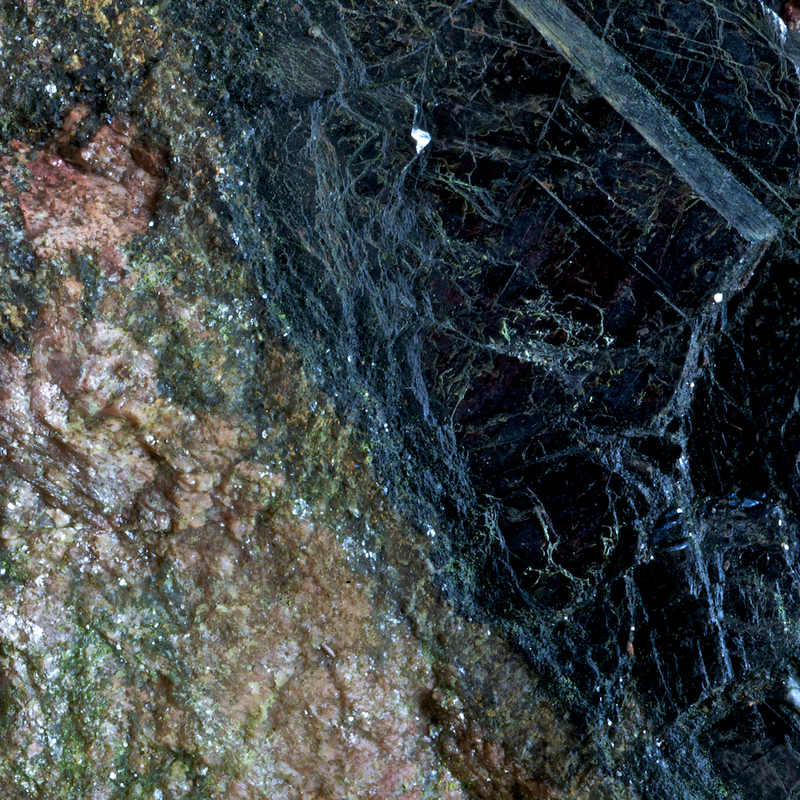 The sediments trapped between the internal and external basement zones of the Alps exhibit one of the highest metamorphic gradients in the world with one unit going from amphibolite grade (shown above) to sub-phyllite in just a couple of kilometres. Some of the faces with white kyanite acted a mirrors in the bright sunlight. You couldn’t examine the mineral texture without sunglasses. My last day in the field was my 20th birthday. After almost six weeks mapping, I had just one last valley to map. And, halfway up the valley I found a rock that I was not anticipating to find. This has taught me never to assume anything where mapping is involved and always check everything out. I had to work very hard to sort out that valley’s geology because I had a train booked home the following morning. I returned to camp absolutely exhausted but ultimately triumphant. 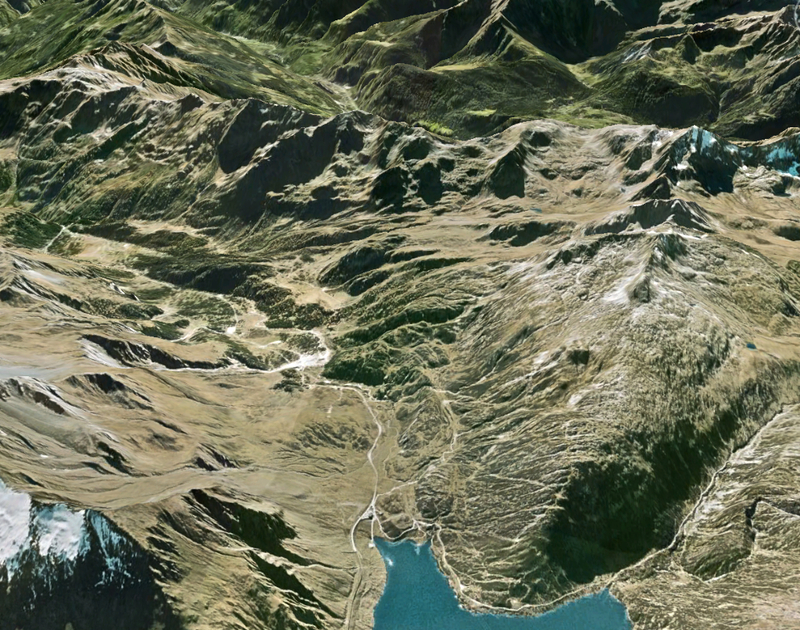 Google Earth view of my undergraduate mapping area, from the lake to the top of the ridge in the middle distance. The foreground ridge by the lake is Precambrian external zone basement gneiss and the middle distance ridge is Precambrian internal zone basement gneiss. Between them is a sliver of highly deformed and metamorphosed Mesozoic sedimentary cover rocks.